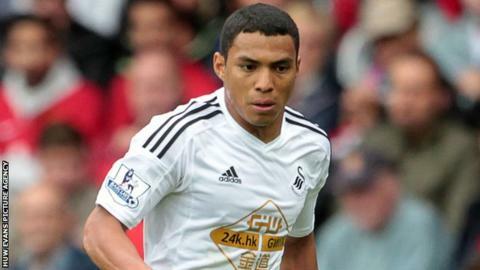 Swansea City winger Jefferson Montero is one of 41 players, coaches and directors named in a match-fixing investigation in Spain. Prosecutors allege almost one million Euros was used to pay Levante players to lose their match against Zaragoza at the end of the 2010-11 season. Manchester United midfielder Ander Herrera is also among the players named by prosecutor Alejandro Luzon. A Swansea spokesman said: "We have had no contact... regarding this matter." Meanwhile, Herrera insists he has never been involved in match-fixing. "I have never had and will never have anything to do with manipulating match results," Herrera wrote on his Facebook account. Montero, who joined Swansea from Mexican club Monarcas Morelia in July, was in the Levante side beaten 2-1 by Zaragoza on 21 May 2011. It is alleged Levante's players were paid to lose the match, which Zaragoza needed to win to avoid relegation. Prosecutor Luzon filed the case at a court in Valencia on Monday. The court document alleges Herrera was one of 10 people who withdrew tens of thousands of Euros funded by Zaragoza in order to pay bribes. Montero's alleged involvement is not described in the prosecution case.